New York Times reporter Ian Urbina has a recent article claiming that lenders taking mortgages on real estate are restricting their borrowers from granting oil and gas leases on the mortgated property. The article also discusses whether the granting of a lease on mortgaged property might violate the terms of the mortgage. Urbina says Congressmen Ed Markey and Maurice Hinchey asked Fannie Mae and Freddie Mac how they deal with oil and gas leases on mortgaged property. Chesapeake said that they don’t seek approval from lenders before acquiring leases on mortgaged property, but wait until they are ready to drill to ask the mortgage company to subordinate their lien to the mortgage. In my experience in Texas, the standard practice has been for the oil company to lease the land first, then determine if it is mortgaged, and if so ask the lender to subordinate is lien. Lenders are generally agreeable, believing that, if a well is drilled, the value of their collateral will be enhanced, since they will still have a lien on the royalty interest reserved by their borrower. I recently learned, however, that Fannie Mae is requiring that its borrowers on commercial properties insert specific provisions in the lease before agreeing to the lease, as well as charging a substantial fee. On new leases of residential lots in the Barnett Shale, Chesapeake is sending a lender subordination form to the lot owner along with the lease and asking the owner to get their mortgagee’s consent before paying for the lease. 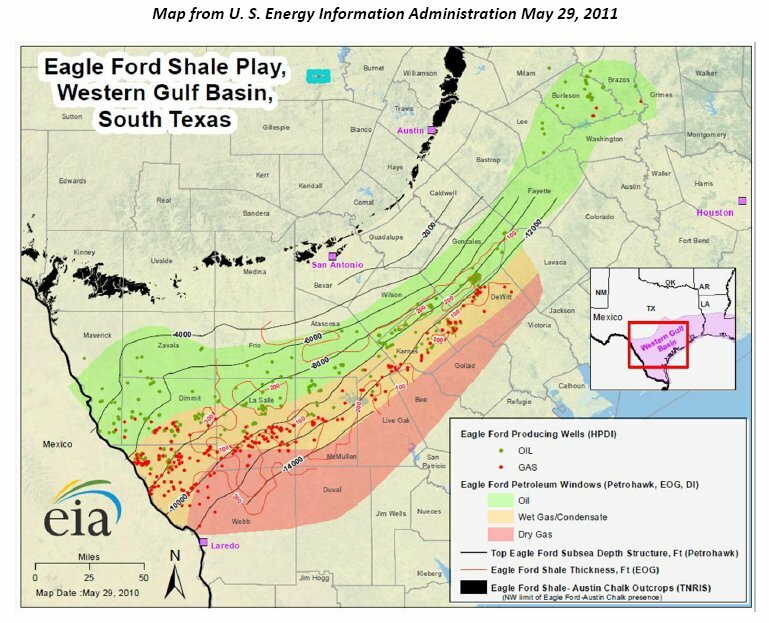 There are now 1,231 wells producing from the Eagle Ford Shale in South Texas, in 25 counties. Total production to date is more than 37 million barrels of oil/condensate and 311 Bcf of gas. The biggest counties are DeWitt, Karnes, Dimmit, Webb and La Salle. DeWitt and Karnes Counties are the best oil producers so far. In DeWitt County, 99 Eagle Ford Wells have produced 6.8 million barrels, and the average peak month daily production was 555 barrels. Webb County is tops on Eagle Ford gas production, with 116 Bcf of gas to date, and an average initial production rate in the first month of 3.4 mmcf from 215 wells. As of last month, 238 rigs were running in the Eagle Ford play (compared to 115 in the Marcellus). Drilling in the Barnett Shale play, a gas play, has declined to its lowest level in seven years because of the low price of natural gas. Kinder Morgan’s acquisition will make it the largest operator of gas pipelines in the US and the fourth largest energy firm in North America. Kinder Morgan is reportedly planning to sell El Paso’s exploration and production assets, for as much as $7 billion. On the local front, in my home town of Austin, the two Brigham brothers have cashed in, selling their company for $4.4 billion to Norway’s Statoil. The Brighams started their company here in Austin several years ago, taking in public, and recently acquired 375,00 acres on the Bakken and Three Forks plays in North Dakota and Montana. Brigham has already been sued by its shareholders, who say that Statoil’s price of $36.50 per share is too low. The task force adopted the following advisements regarding pipelines and roads. • Placement of pipelines should avoid steep hillsides and watercourses where feasible. • Pipeline routes should take advantage of road corridors to minimize surface disturbance. • When clearing is necessary, the width disturbed should be kept to a minimum and topsoil material should be stockpiled to the side for replacement during reclamation, accelerating successful revegetation. • Proximity to buildings or other facilities occupied or used by the public should be considered, with particular consideration given to homes. • Unnecessary damage to trees and other vegetation should be avoided. • After installation of a new line, all rights-of-way should be restored to conditions compatible with existing land use. • Trucking companies partnering with the Texas Department of Public Safety to develop a program that would alert companies when their drivers receive moving violations or drivers license suspensions. 1. Avoiding peak traffic hours, school bus hours, and community events. 2. Establishing overnight quiet periods. 3. Ensuring adequate off-road parking and delivery areas at all sites to avoid lane/road blockage. The task force is supposed to meet monthly. Democratic representatives in Ohio are calling for a moratorium on hydraulic fracturing in that state until the EPA completes its study of fracking. ABC News reported that the Marcellus and Utica shale plays have created thousands of jobs in Ohio, causing people to flock to Steubenville, Ohio, which last year had an unemployment rate of 15%. The Pennsylvania Department of Environmental Protection has told Cabot Oil & Gas that it can stop delivering water to residents of Dimock Township. Cabot was required to furnish water to residents after claims that its wells had contaminated groundwater there. The residents still have a pending case against Cabot. Range Resources is challenging the constitutionality of a town’s drilling ordinance in South Fayette, Pennsylvania as so strict as to prevent any drilling in the town, causeing a taking of Range’s mineral rights. Range’s action is being considered a test case on the limits of municipal regulation of drilling in Pennsylvania. Companies are considering abandonment of their acreage in New York after reviewing that state’s proposed rules on horizontal drilling and fracking.